Grab a cup of tea and enjoy some eye candy this month. (Pretend you've actually taken the time to drive downtown--wherever that is--to visit your local art museum. But so you don't have to, I'm sharing wonderful art finds with you in the comfort of your own home.) I love how so much of classical art is centered around the "greatest story ever told," the most important events in history--the birth, death and resurrection of Jesus Christ. 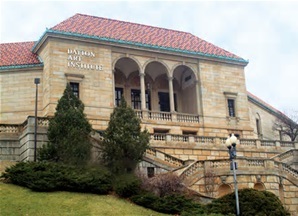 All of the following are from The Dayton Art Institute, Dayton, Ohio, which is housed in a beautiful building. Drivers going through Dayton on I675 get a perfect view of it. "Francken's painting includes a central image of the Crucifixion, and a surrounding rectangle with the martyrdom's of each of Christ's twelve apostles. (Clockwise from the upper left corner: Peter, Matthew, Andrew, James Major, John the Evangelist, Thomas, James Minor, Philip, Bartholomew, Simon, Mark, and Paul.) Together, they reinforce the importance of Christ's sacrifice on the cross, through which he conquered death and offered redemption to all. The Apostles were willing to give their lives to spread Christ's message of salvation. My delight knew no bounds when I came upon this painting in our own Dayton Museum! Bouguereau is one of my favorite artists, after Monet, Mary Cassatt, and other impressionists. I didn't capture a photo of the name of this painting and a quick online look failed to reveal it. It is unmistakable as his work, however, as you can see from other of his works on this page. Interestingly, I have a niece with a face remarkably similar to the girl in this portrait (and in many of his works). She has the face of perfect Victorian beauty. Read was a Cincinnati, Ohio, native, since the age of 10 until his death. "The theme of Christian charity has belonged to the repertory of Christian iconography since the Renaissance. At the root of this allegory are the contrasting aspects of human love versus divine love, the former intended to illustrate human love's fragility and the latter the immortal love of the human soul. During the Counter-Reformation, the theme of a beautiful woman nursing her young undoubtedly would have been recognized as an Allegory for Charity or Love. The woman might also represent the personification of the Church; her children represent the human soul hungry for spiritual nourishment." "A native of Indiana, Richards painted this image in Munich, Germany and described its sentimental subject matter, typical of many late 19th-century works, in a letter: 'It represents a Village maiden musing over her approaching wedding, busy with the last touches upon her bridal dress; you can see by the fresh-made tea placed upon the table, and the chair placed near that she is waiting for her lover who will come now any moment...'"
I would not have guessed any of the above! Would you? How obvious! (In hindsight, anyway.) The cup awaiting the lover! So there you have an eclectic mix of styles and subject matter. Next month, I'll post more photos from this same museum--these with one thing in common, and which makes them special to this regency writer's heart: They are all either late Georgian or Regency era! Be sure to stop by on April 20th! Do you love art? Who is your favorite painter or painters? Linore Rose Burkard is best known for Christian Regency novels with Harvest House Publishers, and now also writes YA/Suspense as L.R.Burkard. Linore teaches workshops for writers with Greater Harvest Workshops in Ohio, is a mother of five, and still homeschools her youngest daughter—preferably with coffee in one hand, and iPad in the other. For free PDFs subscribe to Linore's mailing list at either of her websites. Pre-Order the exciting sequel to PULSE! Available exclusively on Amazon for only $3.99! RESILIENCE: Only the resilient can survive. But at what cost? I was wanting a nice day trip, but out here in Southwest Colorado that's not very practical. Along you come and whisk me away to an afternoon at the museum. Delightful, inspirational, and memorable. Thank you, Linore, for the invitation and the tour. I'm more of a Thomas Kinkade art lover....but these are lovely. Thanks for the tour. Glad you could enjoy them, Chappy! We used to have an Amish store in town with an entire second floor dedicated mostly to Kinkade. I'm afraid I'm a bit of an art snob--I like the real thing. Thanks for coming by!